It was with great honour that we welcomed Mr Nobuki Sugihara, son of Consul Chiune Sugihara, a Righteous Among the Nations, for our September events. Mr. Sugihara spent a week in Hong Kong, from September 18th – September 25th. During his stay, he opened a new, original exhibition on Righteous Among the Nations from Asia, including his father Chiune Sugihara who helped an estimated 10,000 Jewish people escape from Nazi controlled Lithuania. 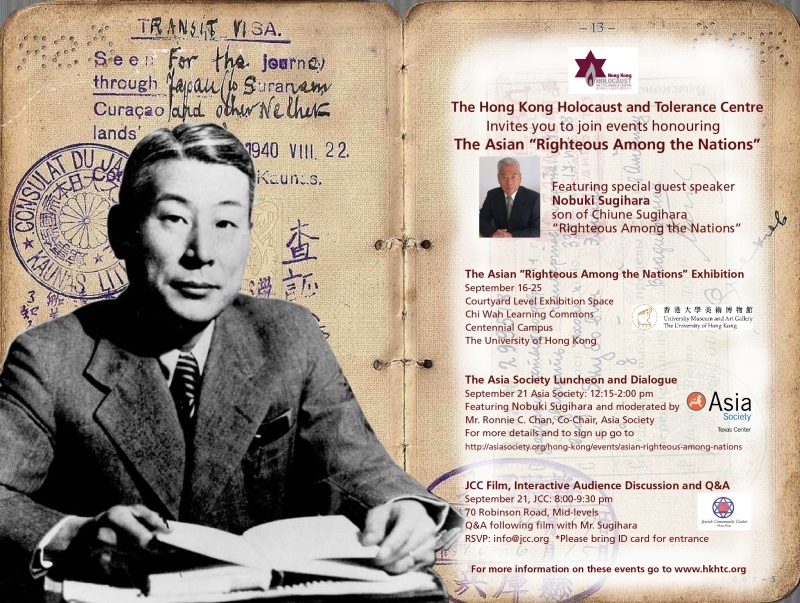 The opening event for the “Asian Righteous Among the Nations” exhibition took place at the University of Hong Kong, on September 19 followed by a film Sugihara: Conspiracy of Kindness and a Q&A with Mr. Sugihara. Mr Sugihara also spoke at Asia Society (in conversation with Mr Ronnie Chan, the Chairman of Asia Society Hong Kong) as well as the Hong Kong Jewish Community Centre. Besides, Mr Sugihara also spoke to several hundred school students, discussing his father’s work and the importance of standing up to evil. Please click here for more photos from our September events with Mr Nobuki Sugihara.